The first Greek New Testament printed in America. This can be found in at least two states. They can be distinguished by look at Jude 25. 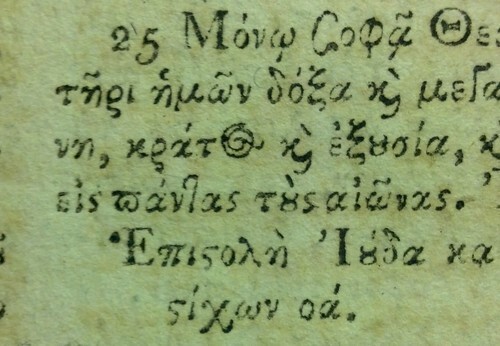 In the first state, the second word in the verse is misprinted as ςοφά, in other copies it was reset as ςοφω. 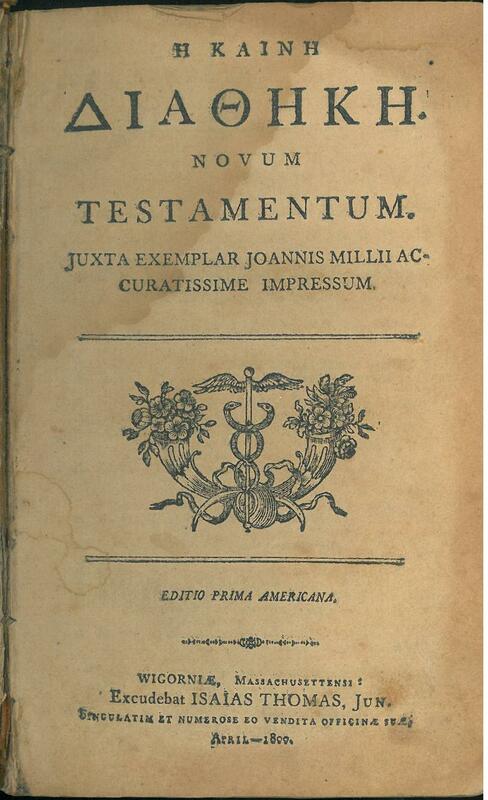 The edition by Isaiah Thomas, Jr. was based on that of the English scholar John Mill. Thomas’ editor seems to have been a Presbyterian minister, Caleb Alexander. Title: Η ΚΑΙΝΗ | ΔΙΑΘΗΚΗ | Novum | Testamentum. | Juxta Exemplar Joannis Millii Ac- | curatissime Impressum. | (a figure) | Editio Prima Americana. | Wigorniæ Massachusettensi: | Excudebat Isaias Thomas, Jun. | Singulatim et Numerose eo Vendita. Officinae suæ. | April - 1800. Comments: This is the first Greek New Testament printed in America. This New Testament can be found in at least two states that can be distinguished by looking at Jude 25. 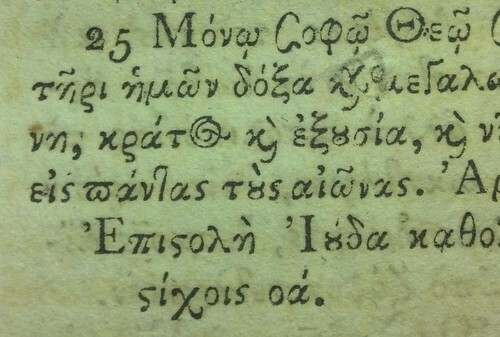 In the first state, the second word in the verse is misprinted as ςοφά, in later copies it was reset as ςοφω. Jude 25 - First state. Jude 25 - Second (corrected) state.